Italian cooking reflects the landscape and spirit of Italy, with its bright colors and strong scents, sunshine and laughter, and often the echo of a melody. Italian cooks have no doubts about the excellence of their cooking. They shake their heads when people who don’t know better say that Italian cooking is “a kind of second-class French cooking.” Italians don’t have to imitate the French; they were, in the days of Catherine and Marie de’ Medici, their teachers. Today, relaxed and secure, they produce as though by magic the delights of vera cuina italiana, true Italian cooking. Great Italian cooking is deceptively simple. It does subtle and difficult feats with a few fresh, uncamouflaged natural ingredients. It produces a sort of glorified health food that is usually low in calories and cholesterol but a lot more interesting than most health foods. A meal may be entirely vegetarian, consisting of pasta (which can simply be water added to flour made from grain), fresh tomato sauce, and wine made from local grapes. Dessert is quite apt to be an orange, a pear or other fresh fruit, or some fresh bread with a little chesses; and coffee afterward, a small cup half-filled with freshly made espresso. Even the sauces are usually simple and low in calories. A friend of mine who gains half a pound “just looking at a blended French sauce” never worries in Italy. One secret of. The Italian magic that makes a few simple ingredients work miracles is having the right combinations, a basic knowledge of what-goes-with-what. In restaurants frequented both by Italians and foreign tourists, for example, I have noticed that these two groups order differently. 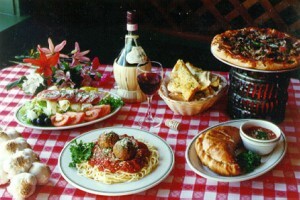 Italians start with pasta or soup, then eat meat or fish and some vegetables. But foreigners sometimes order both fish and meat, and they may have as many as three different sauces. Then they gorge on ice cream and complain that “one gains weight in Italy.” The Italians, meanwhile, have built their meals as an artist builds a painting, with a sense of proportion and harmony. 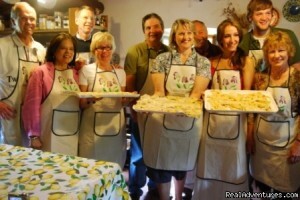 Actually, Italians rarely speak of “Italian” cooking, but of the cucina of their own region. The purest, simplest cooking is done in Tuscany (Florence), where the descendants of the Medicis have not lost their fine Italian hand. A much-loved local dish, fagioli nel fiasco, is beans cooked in an empty Chianti flash, served could with oil, lemon juice, salt and pepper. Roman cooking has created few specialties, but typically Roman is saltimbocca (“jump-in-the-mouth”) alla romana – slices of ham on veal escalopes, seasoned with sage, cooked in butter, braised in white wine. Among Italy’s many culinary regions Bologna remains outstanding. Bolognese state categorically that they invented tagliatelle (band noodles), tortellini (small pasta rings filled with anything from chopped pork and sausage to cheese and nutmeg), and involtini (veal rolls, stuffed with chicken livers, prosciutto, small onions, herbs). Piedmont claims birthright to bollito misto (“mixed boiled”): boiled beef, veal, chicken, tongue, pork sausage, served with an herb-rich salsa verde (green sauce). Lombardy (Milan) gave us costoletta alla milanese, veal cutlet, and osso buco, stewed veal knuckles with herbs, served with risotto (rice). Italy’s great culinary unifier is pasta, as Italian as opera, and synonymous with “food.” Pasta professors claim there are “over a hundred varieties.” The main ingredients (wheat flour, water, and sometimes eggs) are the same, but the various shapes and textures convey different tastes Pasta’s variety is further increased of course, by the things you do to it. It can be boiled or baked, served in an endless variety of sauces, stuffed with meat or vegetables. And even when a family can afford only the pasta itself and a little wine, they feel they’ve eaten well. Tomorrow may be better. Italians are optimists. Two other staples which can be substituted for pasta are polenta and rice. Polenta is derived from what the ancient Romans called pumentum, then a wheat mush, often all that the poor could afford. Today polenta is made of corn meal. Italy is Europe’s leading rice producer, and the best comes from the Piedmont region. Best-known are Venice’s risie bisi, rice and tender peas, and Milan’s delicate ristto alla milansese, braised rice with saffron. Italian meat dishes are delicious. Some of the world’s finest steaks come from Tuscany, where they raise the Chianina bulls that often weigh a ton when two years old. Most Italians prefer veal, however. It’s white and excellent, form milk-fed animals, and sometimes cooked in milk, too. Italy also has excellent pork products – the Parma ham, cured in the air of the hills. Rome is proud of its spring lamb and Sicily of roast kid. As a cheese country, Italy is second only to France. Its cheeses are world-famous: parmigiano (Parmesan), which is at least 1000 years old; gorgonzola, from the Po Valley; the delicate, creamy provolone; the soft-white mozzarella and ricotta, excellent for cooking; and Bel Paese, created around 1920. Though many Italian dishes are deceivingly easy to make, they should be prepared with great care and only the freshest ingredients. (Lasgne verde, for example must be made with fresh spinach or not at all.) In Italian cooking there must be no heaviness. You cannot put a sauce over something that is doubtful. The taste should be almost transparent; nothing should be faked. Use vegetable oil, not butter, no matter what the great French cooks say. Oil is lighter, more digestible than other fats. And of course it is low in cholesterol. To imitate Italian dishes, you must begin with the very best possible Italian olive oil. Don’t try complicated combinations; use a simple recipe, and get all the proper ingredients. Follow a good cookbook, use the best herbs and spices you can get, and use them as exactly as possible. Unfortunately, even the best American food stores don’t always carry fresh Italian herbs. Cook vegetables in as little liquid as possible and for the shortest possible time to preserve their juices and flavors. Remember the importance of balance and simplicity: Italians eat spaghetti or rice as the first course and then have meat or fish in the second. And remember that deserts are simple: fruit and cheese are best. Don’t fuss about wine vintages and labels. In Italy there is bianco and there is rosso – white and red, inexpensive, rarely great, almost always good. Don’t take your gastronomia too seriously. The Italians don’t. They eat their main meal around 1 p.m. They take their time, and they love to eat al fresco – under the trees in the garden or under the striped awning on a sidewalk. There may be the sound of music, an opera melody, a Neapolitan folk song or the melodious voices of the Italians nearby. Years ago, I had dinner in Rome at a crowed trattoria. A waiter stumbled and poured a whole bottle of red Barolo wine over the pants of my new silver-gray suit. Barolo is a wine that goes well with roasts, certainly not with pants. Yet here I was, drenched in Barolo from the waist down. I also was in Italy where nothing is very various. The red-suspendered proprietor took me into the kitchen and asked me to take off my pants. Some elderly mamma-mias draped a couple of soiled table-cloths around my torso, and I walked back to my table. I had spaghetti alla carbonara, with small pieces of pork, egg and cheese. A bottle of Barolo (which I hadn’t ordered) was served to me. Then I was asked to come back to the kitchen, don’t ask me how, but my pants were all washed, dried and ironed. I put them on. No stains. No charge for the Barolo. That’s the Italian style. 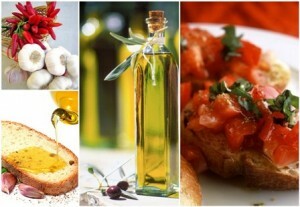 Italian cuisine is best among all other cuisines in taste and price. As an Italian cuisine, we have a huge variety of dishes, so we can have different meals regularly in proper budget.